Photograph courtesy Tony Sayer A study of 24150 at near Dunfermline Townhill on June 10th 1976, it appears to have had one of its upper grilles sheeted over. Despite its reasonable external condition it will soon be retired and consigned to Doncaster for scrap. The fourteen year nine month career of D5150/24150 was spent allocated to Eastern Region and Scottish Region depots. After withdrawal 24150 was stored at Millerhill from October 1976 until June 17th 1977 when it was forwarded to Doncaster Works and broken up by July 1977. Noted Darlington Works June 1962. The completion of D5147 - D5150 closed out the order books for the BR/Sulzer Type 2s powered by the 1,160hp 6LDA28A engine, these last four locomotives were laid down at Derby during the autumn of 1960, with D5150 deliveed to Gateshead at the end of February 1961. These locomotives were boiler equipped, so found themselves diagrammed for both passenger and freight work in the Newcastle area, including the principal routes to Edinburgh, Carlisle & York. On May 20th D5150 was in charge of an afternoon Manchester – Newcastle relief, the Type 2s were frequently diagrammed for the secondary passenger workings between Newcastle & Leeds. D5150 was noted at Darlington Works during August. D5150 was at Darlington Works during June. Photograph courtesy Peter Rigby. 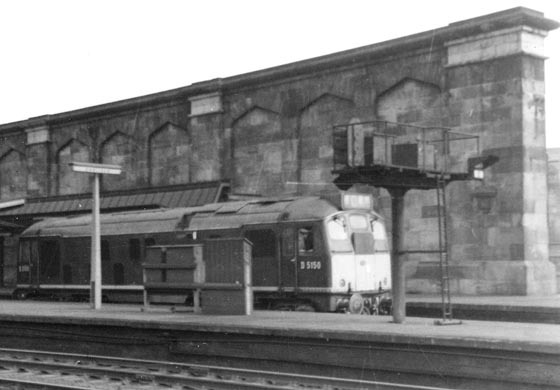 D5150 at Carlisle during August 1962 and is somewhat dwarfed by the stone walls that form part of Carlisle station. It appears the locomotive is backing down on to something parked in the bay platforms. The Gateshead Class 24s were frequent visitors to the Carlisle area on a variety of workings. On July 27th D172 on a Peterborough – Edinburgh passenger failed at Aycliffe, assistance arrived in the shape of D5103 & D5150, complete with brake tender! D264 was waiting at Newcastle to replace all three machines. During 1967 double headed Gateshead Type 2s were again diagrammed to work the Saturday’s only Newcastle - Ayr - Stranraer passenger in both directions. So noted in June & July were D5097/5112 (24th), 5149/5112 (1st), 7601/5149 (8th), 7611/5051 (15th) & D5101/5112 (22nd), ScR examples filled in, especially on the eastbound runs after failures had occurred. These workings must be considered one of the more interesting service/routes worked by the Class 24's, regretably there seems to be little photographic record of these workings. On July 22nd D5150 worked the eight coach (1N73?) 16.40 Blackpool - Newcastle service. Presumably it had worked the westbound leg earlier in the day. Condition July: green livery with small yellow warning panels. The final summer working of the Saturday’s only Stranraer – Newcastle passenger occurred on September 2nd with Gateshead’s D5150 & D5147 in charge. Visitors to Derby included D5150 in February. Presumably at this Works visit the locomotive acquired blue/yellow livery, with two numbers on each bodyside and a BR emblem on each cabside. The locomotive arrived at Derby in green livery with small yellow warning panels with curved upper corners. It also carried steam style 52A shedplates on the cabfront. Condition July: blue/yellow livery, two numbers on each bodyside and a BR emblem on each cabside, straight sided sandboxes, three-rung bogie mounted footsteps. February 7th proved to be a day of heavy snowstorms, with much widespread disruption throughout the country. On the Woodhead route the Manchester - Sheffield electric service encountered delays, diesels taking over a number of the services. East of the Pennines delays occurred and services were amended to fill in the gaps. The 21.50 eight coach York - Aberystwyth mail was surprisingly hauled by 5150, covering for a local service between Leeds & Huddersfield. Noted under repair at Glasgow Works during October was 5150. 5150 was at Derby Works during January. 5150 was noted at Glasgow Works during February. Easter 1971 had been marred by an ongoing ASLEF work to rule. Amongst other issues crews were refusing to operate locomotives which did not carry a supply of ear protectors. These uncertain conditions hampered the promotion of the many excursions over the long Easter weekend, whilst many did not run, those running tended to be lightly loaded. One that did run was on Easter Monday, April 12th, with 5150 hauling the 1G08 09.30 Castleford - Scarborough. 5150 visited Glasgow Works during February. 24150 was under repair at Glasgow Works during June, being noted ex-works on Eastfield depot on June 28th. Condition (after Glasgow repair): blue/yellow livery, gangway doors sheeted over, shortened fuel & water tanks - both fitted with circular gauges, blanking plates fitted, hand/footholds plated over, ridge sided sandboxes, three-rung bogie mounted footsteps. By late August the No.1 cab had acquired a small crease high up on the sheeted over gangway doors. 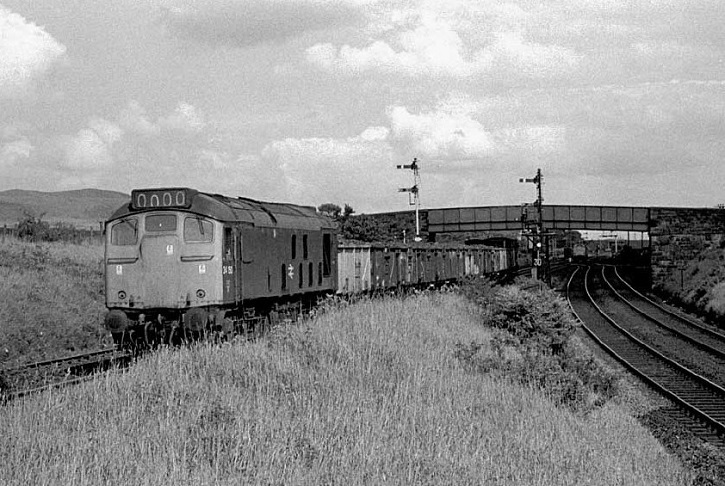 The big inroads to the Class 24s in the summer affected 24150, but only to the extent that it was transferred from Eastfield to Haymarket during August. Photograph courtesy Tony Sayer In its last six months of service 24150 is seen on a coal train at Dunfermline on June 10th 1976. On July 18th 24150 was noted under repair at Haymarket. On October 4th 24150 was noted on the 1E83 17:10 Edinburgh - Newcastle passenger service. 24150 was stored during October/November, initially at Millerhill, then withdrawn at the beginning of December. Condition final: blue/yellow livery, gangway doors sheeted over, shortened fuel & water tanks - both fitted with circular gauges, blanking plates fitted, hand/footholds plated over, ridge sided sandboxes, three-rung bogie mounted footsteps, one ventilator on the top row (BIS side) filled in with what appears to be a rusty sheet of metal. With the delivery of D5150, the orders for a total of 151 Class 24s were completed. 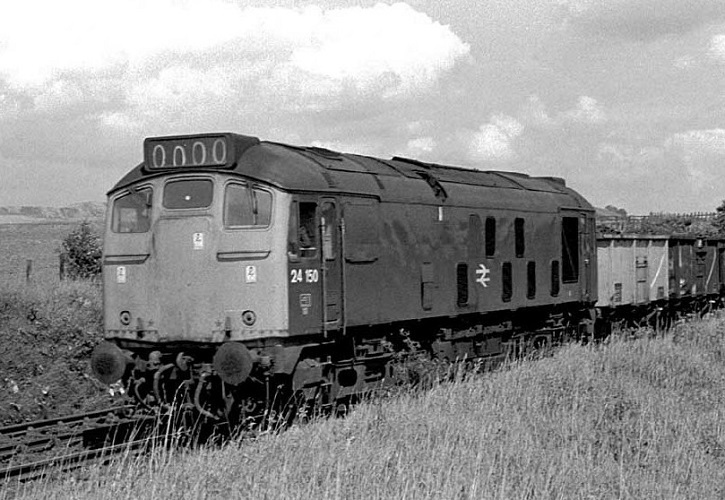 There would be a gap of about six weeks before Darlington released the first Class 25/0 and almost two years before Derby released the first of its Class 25s - D5186.